Grind almonds in a food processor (blender), until there are no large pieces left. In a shallow bowl combine ground almonds, flour, salt, pepper and parsley. In a separate bowl whisk egg white. Dip shrimp in egg white, then dip in the almond mixture. Make sure it is evenly coated. Line on a parchment paper lined sheet or plate. Heat oil over medium heat. Cook shrimp for 3-4 minutes, turning once, until pink and golden. Place on a paper towel lined plate to cool a little. Serve (or top the salad with it). 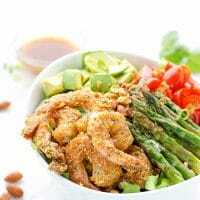 In a deep salad bowl place chopped lettuce, then the asparagus, tomatoes and avocado. Add shrimp, then sprinkle some scallions and chopped almonds (optional). Pour dressing. Almond crusted shrimp recipe adapted from Blue Diamond. You can serve shrimp on the side, if you'd like to.